Sleeping outside requires a proper preparation with lightweight apparels and sleeping pads or bags. 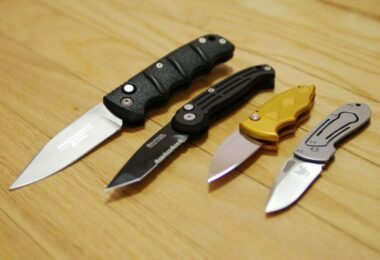 One has to make a choice between the synthetic and the natural insulation when purchasing these outdoor tools. Each choice has its downside and upside. To save you all the energy of hunting for the ideal sleeping bag, we’ve provided you the best ultra-light sleeping bags on the market, the TETON Sports LEEF Ultra Light Mummy Sleeping Bag. This bag is sought after by its supreme features despite being a synthetic bag. Teton Sport is a high quality brand that is known throughout the hiking, camping, and outdoor communities as a great company that makes durable, long lasting products that do work effectively. All year around, campers predominantly use Teton Sports products to make their outdoor adventures more comfortable and fun. Besides sleeping bags, the company is renowned for its backpacks, tents, cots, and other camping accessories to make your outdoor adventure even more memorable. The Teton LEEF sleeping bag is a perfect item for campers who are concerned about very cold temperatures. It is designed with contours to keep your whole body warm, has extra insulation in areas where the body tends to be cold, and is water resistant. Using a mummy style sleeping bag gives you more leg room and shoulder room, which can provide comfort at bedtime. Teton Sports’ sleeping bags are high performance, comfortable, and made from tough material to last. Every avid camper knows that there are several factors that go into choosing the right sleeping bag. This particular sleeping bag will not disappoint. The features included with this sleeping bag will guarantee that your nights camping will be dry, warm, and very comfortable. The size of this sleeping bag is 87 x 34 x 22 inches and gives you lots of leg room and shoulder room for those like need a little extra space, which is a great thing when having a mummy sleeping bag. You will not feel stiff or rigid while you are going to sleep, and you will have space to reach down into one of the pockets for your cell phone or mp3 player for some night time music. Another great thing about this sleeping bag is that it is big enough to fit a larger framed person in it without issue. The entire pack size itself is 15 x 9 x 9 inches, which is when it has been fully compressed down. This should fit nicely into any vehicle when going camping without issue. If you are taking it on a hike along with your other gear, it will fit nicely in your backpack or attached to it. However, depending on your type of outdoor excursion and how far you are going, you should consider your gear weight when you are going to be hiking or backpacking anywhere for long periods of time. 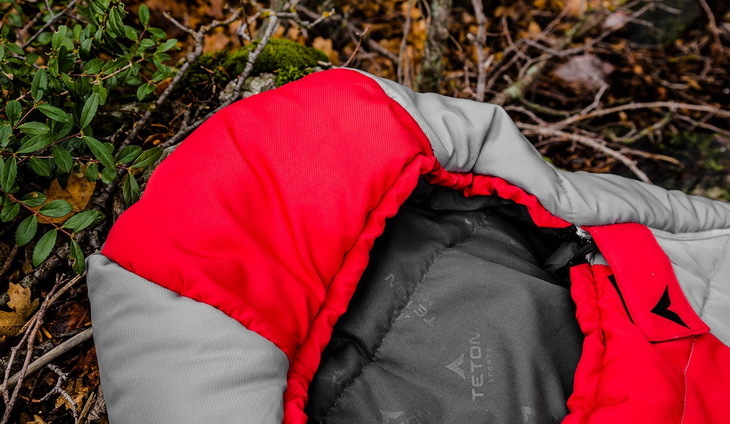 The design of the Teton Sports LEEF sleeping bag makes it easy to love. This sleeping bag comes with a sleeping sack that compresses to save on space, which includes a drawstring, as well as a barrel lock. Also included is a zip pocket on the interior, as well as zippers that will not snag, which makes this sleeping bag effortless to use. The zippers have a full zipper draft that will not allow cold air inside of your sleeping quarters. The three piece gap hood is one prominent feature that will stay close to your face so that the cold air stays out and warm air stays in. This feature is highly recommended during winter camping, hiking, or backpacking. Also featured is a body mapping technique that provides warmth in certain areas of the body that are known to need it most, especially the feet. This will also work with freezing weather, with ease. A diamond rip stop shell is featured on the outside of the sleeping bag, which is water resistant and puncture resistant. The insulation is made with Polar Lite Micro Insulation. With the outside liner is a double brushed P5 Poly Hi Count, with the 40 D Rip Stop shell and made with Nylon. This is great for a 0 degree Fahrenheit sleeping bag like the LEEF. The insulation is synthetic, but not bulky, and is made specifically for colder temperatures. The P5 Poly Hi Count keeps out humidity so that you stay dry and happy. The weight of all of your gear combined will help to determine how heavy your sleeping bag can be. If you are setting up your tent and leaving your sleeping bag inside of it, then you may not worry too much about the weight of your sleeping bag. This sleeping bag weighs in at 4.2 pounds, which is light weight but heavier than other sleeping bags, considering others weigh 2 or 3 pounds. 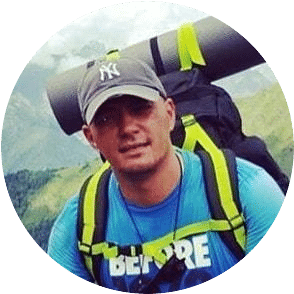 If you are hiking mountains and going to be camping in different places each night, then you will carry your sleeping bag along with your other gear, so weight can come into play here. Most hikers and travelers want to keep their gear as light as possible so they do not become weighed down while enjoying the outdoors, or going from location to location. The added weight comes from the insulation that will keep you warm at night. However, if this is not a factor for you, consider another Teton Sports sleeping bag. When you are choosing a new sleeping bag, keep the weather in mind. This particular sleeping bag is great for frigid temperatures and works fantastically at 0 degrees Fahrenheit. While the weather does not always get that low, it is normal for the weather in some states, or even on mountains, to become very cold at night, dropping down to 20 degrees and less. That is when you will want this sleeping bag. However, this is not your ordinary sleeping bag. 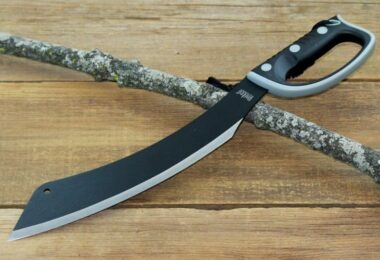 You will not want to take this on a summer camping vacation. Many people report getting warm inside of the sleeping bag once the temperature is over 40 degrees. It is preferred that you use this sleeping bag in the winter, early spring, and late fall, where temperatures are cold and windy. 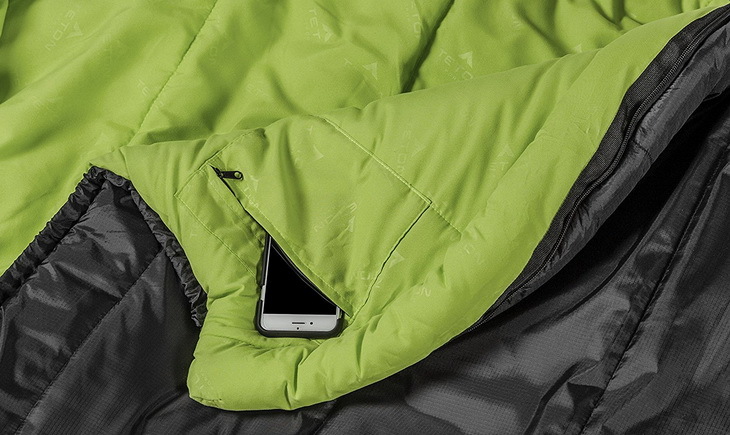 Speaking of windy, did you know this sleeping bag is great for blocking the wind? It’s specially made to block wind and keep cold air out, allowing you a warm sleeping experience in the great outdoors. Comfort is another supreme feature that Teton has optimized in this sleeping bag to make sure that you do not regret a single moment of camping. The first feature that aids in comfort is the micro-fiber insulation that enhances loft and compressibility. The cushioning is competitive and comparable to the Down insulators as it is synthetic. But we do not imply that it is better than the natural insulators of Goose and Duck Down. Sleeping in this bag will not differ hugely from sleeping at home in your comfort. From the foot box to the 3 piece of the hood contours, it is well designed to deliver the unrivaled warmth to outdoor activists. This mummy bag has an anti-snag zipper with a full-length zipper draft tube that reduces the cold spots. That’s an added comfort to your sleep. Of course, we cannot mention comfort without mentioning how lucky you are to sleep in a larger and spacious backpacking bag like this one. This ensures that you can move your body around, or even reach out on your iPod to stream music from your pockets while in this bag. A taller person will also find it conducive to use the bag because of its larger room. That is the comfort we are looking for. Did we mention water and weather resistance? These are the features that add to the enhancement of comfort. No harsh weather is a match to such features. This ensures that you sleep comfortably notwithstanding the inclement weather conditions. 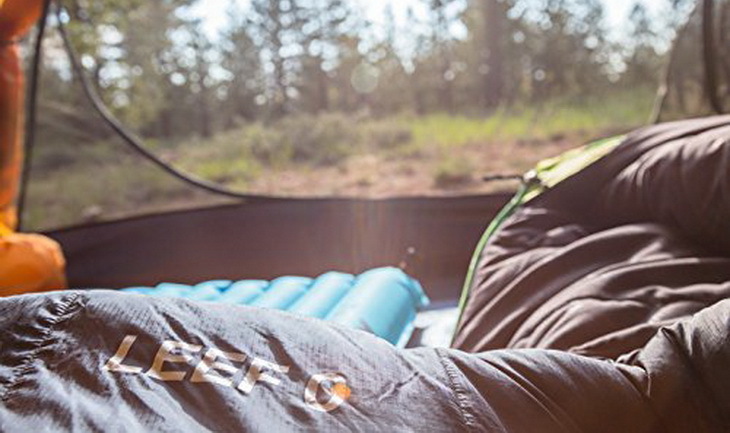 The Teton LEEF sleeping bag is made unique by its sought-after features such as the body map technology that ensures that your body is kept as warm as possible on all corners. So they will be no cold spots felt. The main focus is paid on your feet where other sleeping bags fail to capitalize due to their flaws in the designs. With a survival rate of 0 F degrees, this emerges as the best synthetic sleeping bag any hiker would appreciate. The 3 piece hood contours add more features to this bag. This becomes indispensable during inclement temperatures because your head will be kept unsurpassed warm. The anti-snag zipper further reduces the cold spots to make sure that you remain warm all over. It is also worth mentioning that the bag features the micro insulation that ensures that you withstand the freezing temperatures. This typical insulation also narrows the difference between the Down insulators and synthetic sleeping bags. Usually, synthetic sleeping bags have been notorious of bulkiness. It’s a different story with the Teton LEEF sleeping bag. 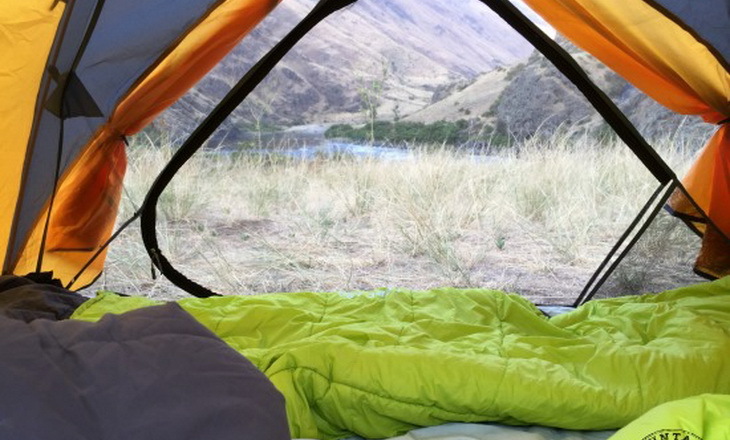 The LEEF sleeping bag offers you the best value for money. 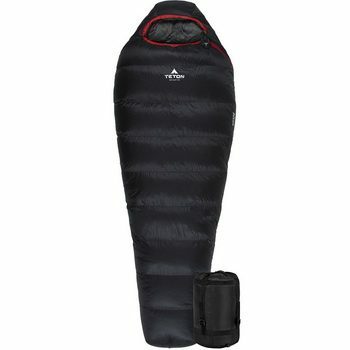 You only have to spend less than $100 to have this mummy sleeping bag from Teton. Isn’t this a great value for investment considering that you can use it in extreme temperatures? Of course it is! However, if you want an extra cushioning, you may opt to get the sleeping pad like the Klymit Static V Lightweight Sleeping Pad for under $60. With regard to the guarantee, the product is covered by a limited lifetime warranty. The company strives to satisfy its customers with products of top notch quality that last long. With that in mind, should you product give you problems, the US-based customer service will be glad to help you get it sorted. Other customers have praised the way their issues were solved with ease when they needed the customer service center. 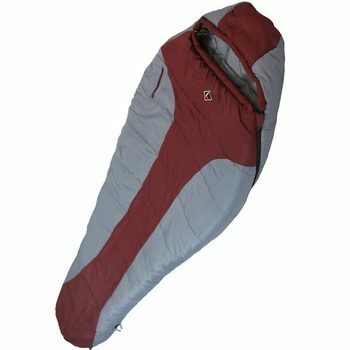 The Ledge Sports FeatherLite sleeping bag is a competitive model that is also made of a synthetic fill to keep you warm. 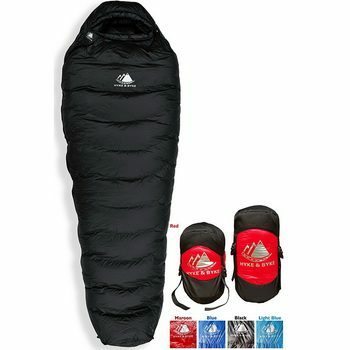 It is a great sleeping bag for ultralight hikers with its light weight of 3.8 pounds. The fill weight is 1.9 pounds, which is light enough for minimalist backpackers. We used to seeing synthetic sleeping bags as bulky and heavy outdoor tools. But these days technology is making provisions for us to have portable bags that we can easily move from one place to another effortlessly. Included is the T-8 compression bag in which you can easily store this bag. For durability purposes, the bag is made of a Dobby diamond 250T Ripstop Shell and Softech ll 210T Liner. The zippers are YKK branded. The bag further features a continuous filament fiber fill compared to the micro fiber fill of the LEEF. These are competitively warm to let you survive the freezing temperatures. They have the same temperature rating of 0 F degrees. If you are under budget, this model is suitable for you. You can have it under $80. But looking at the features, it transpires that the Teton emerges as the most advanced sleeping bag with superior features. Included with the lightweight compression sack and five color options, the Hyke & Byke Snowmass offers a fierce competition to the Teton LEEF sleeping bag. The company has put more efforts in trimming excess weight and in creating more space for backpackers, hikers and campers to sleep comfortably. The ultralight quality duck down has been used as the insulation fill. This is the main difference between these sleeping bags. It provides the best warmth-to-weight ratio. Duck down of highest fill power emerges as the winner over the synthetic fill. 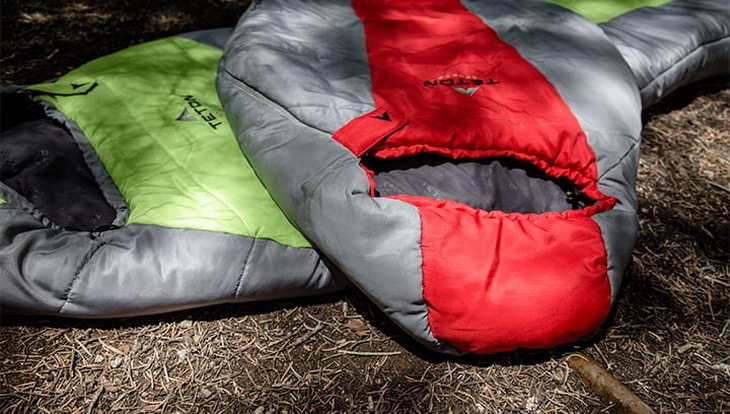 So if you are into natural fills, this sleeping bag is for you. But beware, duck down has the downside should it get wet. It loses its loft and comfort and takes time to dry. Moreover, you have to pay extra care especially when cleaning duck/goose down. The more care you give, it is the more durable it will become. Throughout the camping seasons, it will keep you warm. 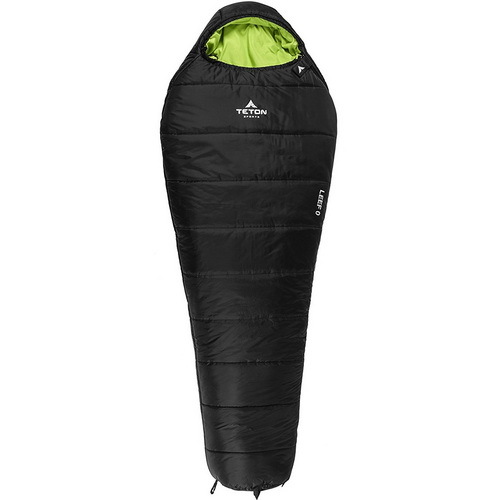 The sleeping bag features supreme waterproof fabrics and insulation capabilities. Even in terms of weight, down fill is lighter than synthetic fill. But with the advancement of technology, we get to see lighter sleeping bags like the Teton sports LEEF with micro fiber insulation. The outer shell is made of a water repellent 400T 20D Ripstop nylon fabric liner with 2 YKK zippers. The shoulders and the footbox are wide enough to give you a comfortable sleep. You have the choice between the regular and long sizes. Although the duck down appears to be the unrivaled natural fill insulation, you must be prepared to pay more. This sleeping bag is more expensive than the LEF sports sleeping bag. It is nonetheless a great investment. For those prioritizing duck down fill insulation sleeping bags, Teton has made sure that you do not opt for other models. The company has the Teton Sports Altos sleeping bag with features of premium quality. The compression sack is included so that you can pack easily to another location. The bag is, however, more expensive than the synthetic insulation fill. But it is a great investment for those looking for the highly rated duck down sleeping bag insulation. The features that catch our eyes included the MTN-DRY feature that repels water to make sure that you always stay dry in snowy conditions. The bag further commands the high-quality construction made with the tough ripstop shell to survive rugged weather conditions. The nylon fabric has been used in the design. Like the synthetic option, the 3-piece hood contours are featured to keep your head and your face warm amid the harshest temperatures. Other features are identical to the LEEF sleeping bag. These include the vaulted footbox, anti-snag zipper with a full-length zipper and the space. The company offers a limited lifetime warranty for all its products. Teton Sports put together all of the features mentioned above in one quality sleeping bag that is sure to work on those cold nights. They took into account that campers, hikers, and backpackers need a sleeping bag that will keep them warm when they are in terrain that is less than tropical. It is light weight, and will easily fit inside of your backpack or can strap to your gear in a pinch. This manufacturer makes many quality sleeping bags for various types of weather, each one tailored for a specific type of weather or comfort. Some are made for summer type weather, some are bigger, smaller or even made for two people to sleep in. Colors also vary on many Teton Sports sleeping bags. Choosing can be difficult, but if you narrow it down to exactly what fits your camping style and situation, then you will find exactly what you need when it comes to Teton Sports products, especially the sleeping bags. Compression sack can feel too small when putting the bag inside of it. Not good for year around camping, namely summer. Users may seem too warm if the temperature rises over 40 or 50 degrees Fahrenheit. The Velcro can seem scratchy if it touches your face while you sleep. Taller people have trouble moving their legs about while zipped inside of it. We have reached the end of the review on the Teton Sports LEEF Sleeping Bag! As you can tell in this article, this sleeping bag is guaranteed to last, keep you warm, dry and feeling comfortable on those cold nights in the great outdoors. Not only will your body stay warm, but with the way it was designed, you can keep your face warm with the hood, which not all sleeping bags have! With the mummy shape, you have room to move about and not feel stuck in a regular sleeping bag. The inside pockets allow you to keep your valuables close to you like your keys, cell phone or wallet. The Teton LEEF sleeping bag is a great combination of high quality features. The bag is renowned for its high quality water resistance, synthetic insulation fill of microfiber insulation and the best comfort. It offers the best loft and warmth for the outdoor enthusiast in all the seasons. But it can be unbearably hot in summer. All the important features are included in this sleeping bag. This sleeping bag can hardly stay on the shelves because it works so well and so many people enjoy the Teton Sports brand. This particular sleeping bag is stylish, comfortable and blocks wind from your body as well as preventing cold air from coming inside. With its extra heating in the feet, you are sure to have toasty warm toes when you wake up in the morning! Thanks for reading! 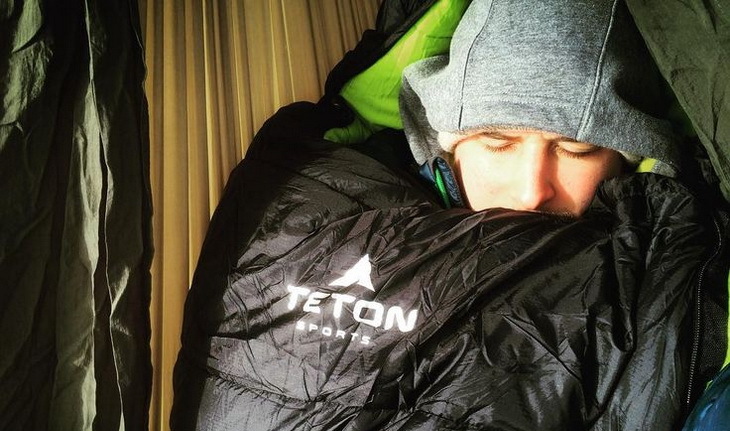 Did we miss anything else special about Teton Sports LEEF sleeping bag? What do you think? Shout out to us in the comments and let us know what is on your mind!